If you’re looking for a secluded, pristine beach, warm turquoise waters, lush tropical landscape and spectacular sunsets – our Caribbean beach resort will be perfect for your visit to St. Croix. 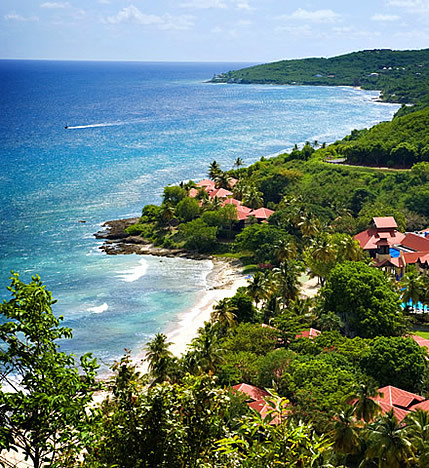 Renaissance St. Croix Carambola Beach Resort & Spa was created to celebrate the unspoiled beauty of the Caribbean by Laurance Rockefeller in 1986. In design, architect William Cox has captured the spirit of a Caribbean-fishing village, with cool spaces, promenades and patios that offer a delightful mixture of privacy and sociability. We offer a full spectrum of activities and services. Whether you want to spend quality time with your family on the beach, seek a romantic spa getaway, dream of a destination wedding, search for world-class golf courses, or bring a group for a meeting or event. Carambola will cater to your every need – all in the United States Virgin Islands. Renaissance St. Croix Carambola Beach Resort & Spa is located approximately 6 miles from the Henry E. Rohlsen airport (STX).